I am up in Salt Lake City helping my mechanic put Lucky Lady Too (LLT) back together. Hopefully we will test fly her today and if all is well I take off for Alaska early next week. Plan to attned the big fly in in Valdez, Alaska on May 11th and since it is a bit early to fly to Eastern Russia will park her in Homer, Alaska by the end of May and return home for the month of June. Then early July over to Eastern Russia if possible then north to Barrow (see where Wiley Post and Will Rogers crashed) then Prudhoe Bay and work my way over to Resolute Bay, Canada... then off to fly over the North Pole and down to Longyearbyen, Norway... then onto Sweeden and Finland, possibly Latvia, Estonia, Lituania and ?? to park somwehere in Germany till I return in Sept. to continue south thru more of the old Eastern bloc countries. Plan to be down to the Middle East by late fall to be able to come across Northern Africa next winter. Will head up Western Europe next spring then onto Greenland and back to Canada. Will touch in from time to time.. promise. PS. 18/04/08 Finally got LLT up in the air yesterday for an hour... she has a new engine, new prop and lots of repairs that need to be done every 5 years or so. She flys about 12 knots faster. She is 40 years old (that 80 in human years). Amazing what a bit of cosmetic surgery can do, what with her new nose job and new heart. Now to break the engine in right. Here is a photo of Lucky Lady Too when she re-entered the USA after 7 1/2 years, 720 different landings in 70 countries. Location, El Paso, Texas. 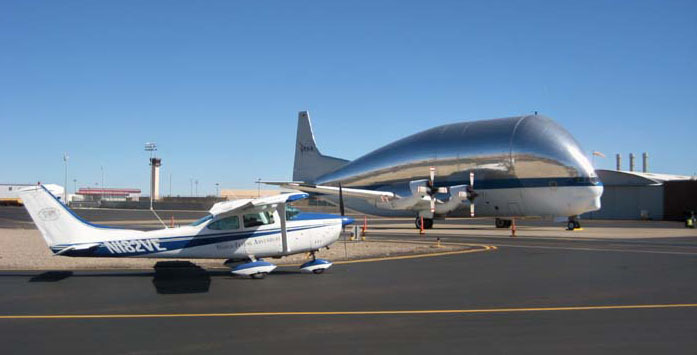 She is parked next to NASA's Super Guppy. 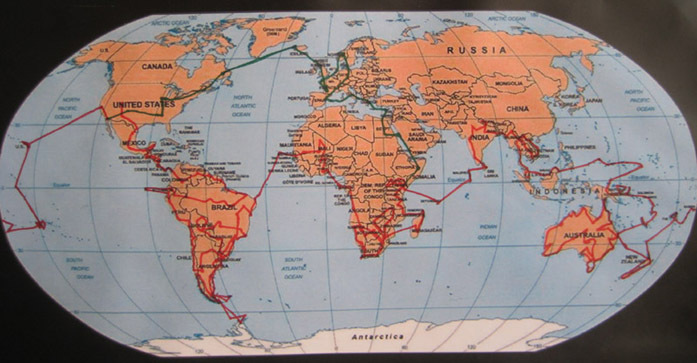 Also is a map of the trip so far. Even though I am back to the USA I am not finished. Got another 2 1/2 years planned to end up with 1,000 landings in 100 countries over 10 years. That is if I don't crash somewhere.